St. Louis (January 1, 2004) — Alvarez Guitars is proud to introduce the Alvarez Yairi MMY1, based on Monte Montgomery’s DY62C, which he bought in 1987 and has been playing ever since. As the result of his aggressive playing style, Monte has broken the neck of his original guitar four times, causing himself and the Alvarez guitar shop ever-increasing frustration. The new MMY1 features a five-piece laminated neck which won’t break, even under the intense stress of a Monte Montgomery performance. 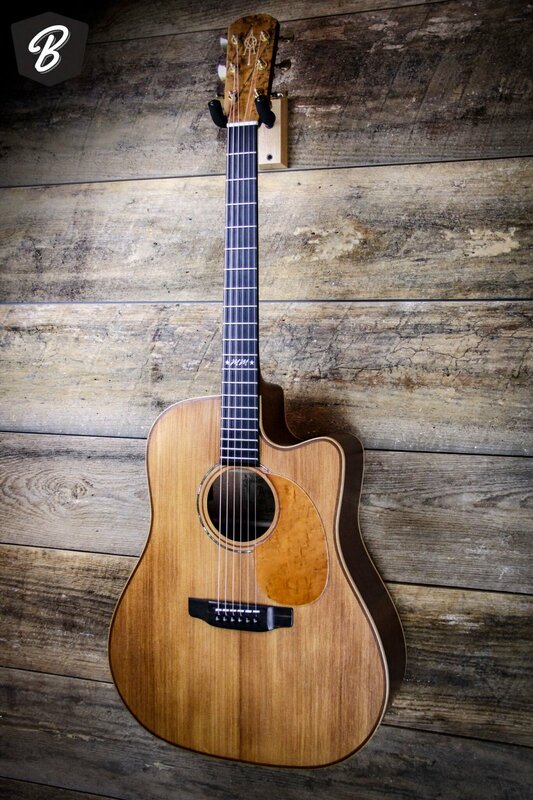 The MMY1 features a hand-distressed solid cedar top designed to look like the current condition of Monte’s original DY62C, as well as a special Monte Montgomery 12-fret mother of pearl inlay. The guitar features many of the same specs as the original DY62C, including the highly figured burled mahogany back and sides and a vintage style rosewood bridge along with many of Monte’s own custom specifications. This is a 2005 model and is in very clean condition and very lightly used. Thanks so much for shopping with BME!